During these early days Mr. Frederick William Gordon Haultain was the President of the Executive Council, or Premier of the North-West Territories, as well as Commissioner of Public Instruction and Commissioner of Education, with Mr. David James Goggin appointed first as Director of Normal Schools then as Chief Superintendent of Education. Both Goggin and Haultain did not support the denominalisation of the North West territories school system aiming instead towards a unified nondenominational school system. Sir Frederick Haultain, “father of Saskatchewan’s Educational System” said that in 1888, there were 96 teachers for 90 schools and 2,409 pupils across the entire North West Territory.The Morning Leader Feb 26, 1920 The Encyclopedia of Saskatchewan places early classes for teacher instruction beginning in 1890. Short training courses offered as set out by a School Ordinance of 1888 provided for Normal Departments with the objective of teacher training. Norman Fergus Black writes that Mr. A.H. Smith, B.A. principal of the Moosomin Union School offered the first classes informally between 1889 and 1890. 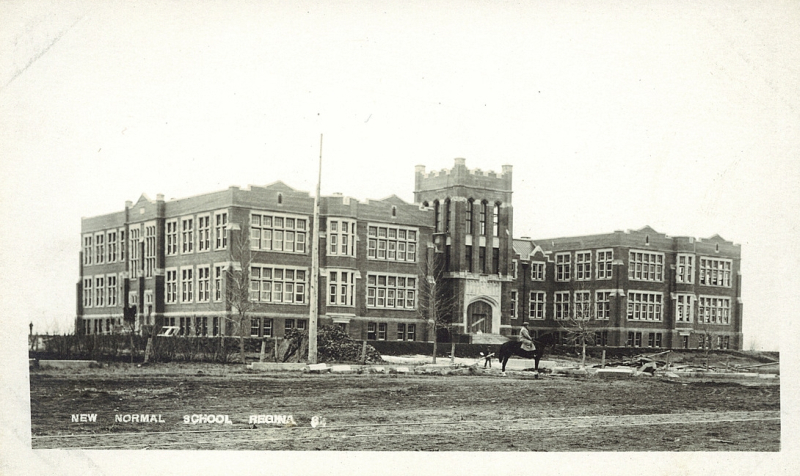 “The first authorized Normal sessions were given by the Board at Regina and Moosomin schools beginning in the fall of 1890” Irene A Poelzer Whenever there were ten pupils wishing Normal training, sessions to obtain a third class certificate were established at any Union School ie Prince Albert, Saskatoon, Yorkton, Moosomin, Moose Jaw, Weyburn and Estevan. H. W. Foght named the two teacher schools a farm community union school, whereas a three or more teacher school was termed a farm community consolidated school. ….. School Inspector John Hewgill taught at Moosomin in 1890 with six in attendance, and William Rothwell, B.A. offered teacher training classes through 1892 and 1893 in Regina. These inaugural classes were “invitational”. James Grassick, pupil of Regina’s first school presented the first teacher’s certificate issued, January 20, 1891 at the Regina school district No. 4 50th re-union in 1935. Ken Horsman relates that Dr. David J. Goggin, former principal of the Winnipeg Normal School in 1884 was the inaugural principal of the North-West Territories Normal School in the spring of 1893 operating out of Regina’s Union School. …..Before the Normal School is formally established under Goggin, fifty five teachers were provided with teachers training by school inspectors in the North West Territories. “The Regina Normal School was initially housed in the Regina Union School at Hamilton Street and 11th Avenue, (also known as “The White School”). Later the teaching college relocated to South Railway Avenue in the “Second Glasgow House”. By 1896, there were 258 students enrolled in the Normal School programme, necessitating a move to Alexandra School according to a report prepared by Allan Duddridge. Goggin, born in Ontario, studied under Egerton Ryerson, an advocate of public education for all. …..Teaching certificates and teacher training was compulsory for teachers in the North West Territories as of 1893 school legislation. Teachers hired came from Eastern Canada with teaching certificates if they were not trained at the superintendent classes. Goggin was followed by D.P. McColl in 1903, the second principal of the Regina Normal School. According to the City of Regina archives, classes were held in the attic of the Union School on Hamilton Street and 11th Avenue as early as 1903. Erected in 1890, it was more commonly known as “The White School.” The Union School closed in 1905. It was torn down and replaced with Simpsons Department Store. Presently the Canada Trust Building is located on the old Union School site. Allan Duddridge states in his report, The Old Normal School: Heritage Assessment of Building and Site in Regina in comparison with Saskatoon and Moose Jaw that Normal School classes were held at Alexandra School on Hamilton Street in 1896 with an enrolment of 258 students, and the Union School was used before this time. Credit: Postcard 13097: Rice Lewis, Alexandra School, Regina, Sask. (c1911) PeelD.P. McColl was soon appointed the Deputy Commissioner of Education under J.A. Calder Minister of Education who then called upon McColl to assume the role as registrar of the newly forming University of Saskatchewan. Lieutenant Thomas E. Perrett became the principal in 1905 having joined the teaching staff in 1904. It was in 1906 that the controversy began regarding the location for the University of Saskatchewan. Moose Jaw, Indian Head, Saskatoon, Prince Albert, and Regina each brought forward their case before the University committee to have the provincial University located in their locale. 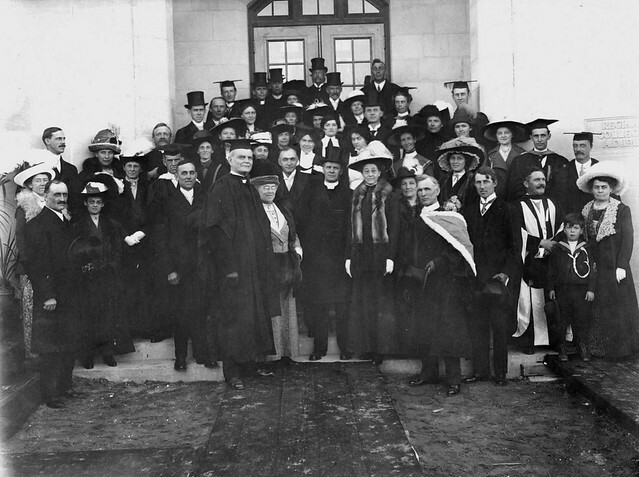 The University Act of 1907 passed by the legislature enabled this body the right to confer degrees in Saskatchewan. The vote on April 7, 1909 was cast in favour of Saskatoon. The Regina Normal school was housed in Alexandra school / the Red School in 1909 when Perrett left to serve with the armed forces. Alexandra School, erected in 1896 was named the Red School, a moniker taken on from its red brick construction. The name changed to Alexandra School in 1906 according to the Regina Public Library. 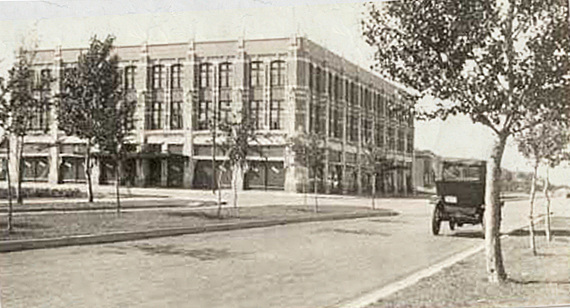 In 1914 it moved again as neighbours to the Regina College site at Broad Street and College Avenue, occupying the space now held by the Fine Arts Building of the University of Regina. Regina Heritage Walking Tours mention that the Regina Police Department was housed in the old Alexandra School in 1921.
Credit Post Card 2662 Normal School Valentine & Son’s Publishing Co. Ltd. Normal School, Regina, Sask. (1910) Peel….. The construction of the Regina College was completed before a permanent building was established for the Regina Normal School. Separate locations, scope and purposes were established for both of these institutions ~ the Regina College and the Regina Normal School ~ which grew and evolved next door to each other on College Avenue. Students at the Regina College who had received their high school matriculation there may choose to pursue teacher training courses at the Regina Normal School. …..The Methodist Church applied for a provincial charter to establish the Regina College in 1911 with Reverend Dr. Wilbur Williams Andrews set up as the first president of the college. The Methodist Saskatchewan Conference did not have its own Theological College, being served by the Wesley College in Winnipeg. Until money could be raised for the Regina College, the city of Regina offered the use of the old Victoria Hospital built in 1901 on Hamilton Street as the new and larger Regina General Hospital was ready to open in 1911. The Regina College opened at 2240 Hamilton Street for classes September 5th 1911. The college buildings were located between Hamilton and Scarth streets and fourteenth and fifteenth avenues. The Regina College built as a residential school for 200 students offered a ladies college, commercial study courses, music academy, collegiate courses encompassing second year university classes, and adult general education classes. According to the “Committee on Education of the Saskatchewan Conference, Methodist Church”, the institute was intended as a residential school offering preparatory classes for Grade XII or first year university, music, business and classes to upgrade public school instruction for high school work.Mombourquette 1986. Francis Nicholson Darke financier, alderman, MP, and Regina Mayor contributed $85,000 towards the Regina College, and was a leading force in raising the remainder of the money to buy land north of Wascana Lake and west of Broad Street for the college building. The Regina College administration building cost $275, 000. …..The Methodist Church received a gift of $100,000 from the Massey estate of Toronto towards the Regina College in 1910. 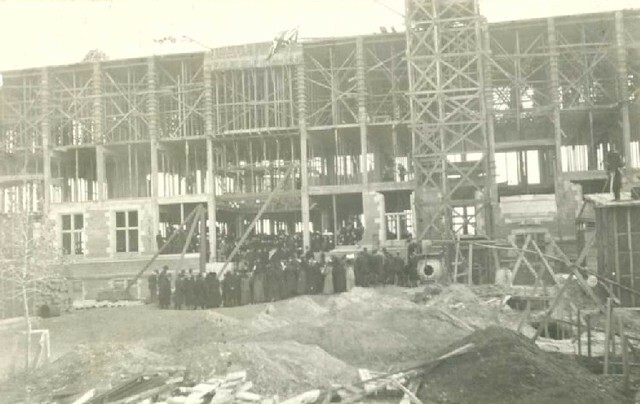 Construction began for the Regina College building on 16th Avenue in May of 1911, and the cornerstone was laid by Lieutenant Governor Brown in the fall of 1911. This building complete with piano practicing rooms, conservatory, dining room, kitchen and classrooms was designed by Brown and Vallance. The exterior was to feature two towers at each end of the building and was designed in the Queen Anne style of architecture. The Regina College featured a musical conservatory and provided preparatory and industrial work while serving as a residential college. 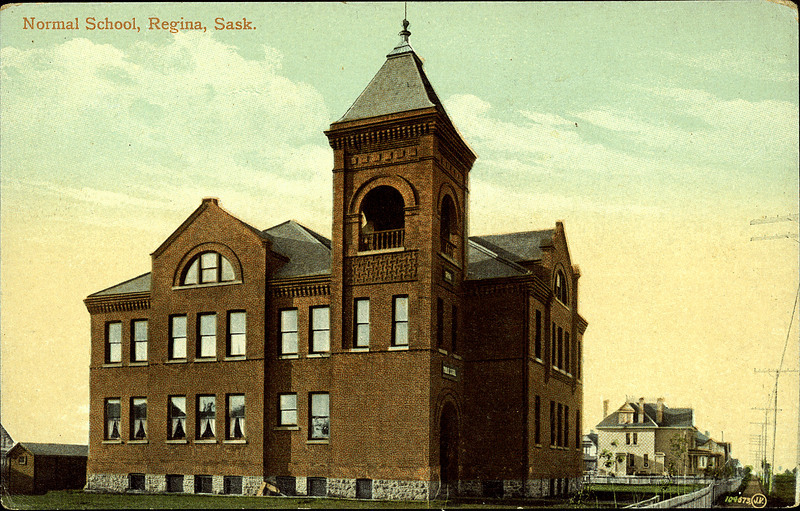 The Regina College opened for classes September 5, 1911 with about 200 enrolled. 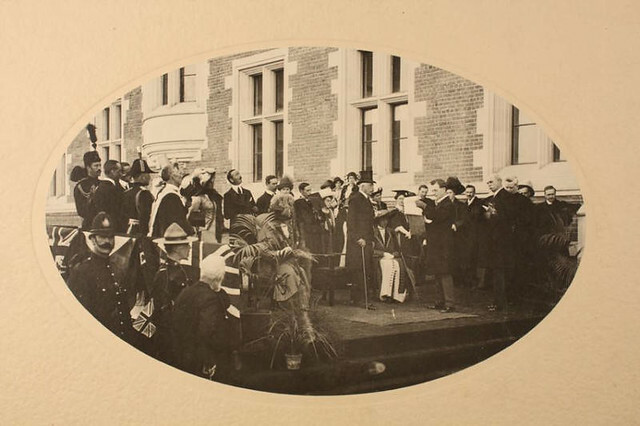 On October 13, 1912, His Royal Highness, the Duke of Connaught, the Governor-General and Commander-in-Chief of the Dominion of Canada, was present at the official grand opening of the Regina College. The college chose “Ut qui ministrat” Gospel of Luke Chapter 22 verse 27 as its motto, translated to “As One Who Serves”. Rev. Robert Milliken, B. D. succeeded Andrews as president of the Regina College in 1913. “A posse ad esse” translated from Latin as “from potential to realty” became the motto of the Regina Normal School. A more literal translation would be from “being able to being” interpreted as “from possibility to actuality” or “from being possible to being actual”. For teachers and students at the Regina Normal School, they adopted this belief that any possibility could become a realty. Official opening of Regina College building credit University Regina Digital Collections…..The provincial Normal School had an attendance of over 350 during the 1911 school year. The initial costs for the new Normal School for Regina were pegged at approximately $300,000. 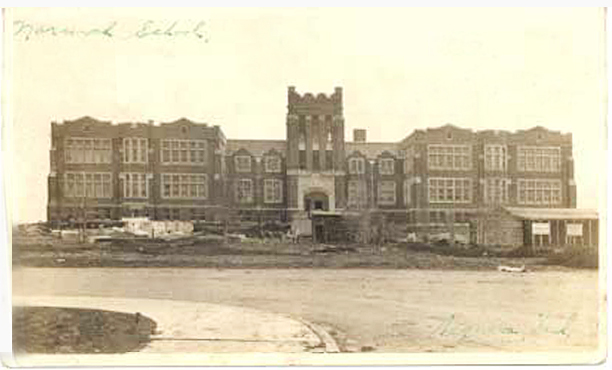 …..The Regina Provincial Normal School was under construction in 1913 on College Avenue and Broad Street upon the old jail grounds. (As noted by the City of Regina archives 16th avenue was renamed College Avenue.) A small section of the school was completed in 1912 comprising administration offices, dining room, chapel, student residences, and library. Thusly, a permanent location for the Regina Normal School was established in 1914 serving the province as the sole teacher training institution until 1922. …..The teacher training institution received its name as a “Normal School” from the French education system “Ecole normale superieure.” Designed in 1913 by the architects Storey and Van Egmond using a Collegiate Gothic style, the cornerstone was officially laid by Chief Justice F.W.G Haultain on March 30, 1913. This ceremony was chaired by Premier Scott. A notice dated November 28, 1913 was placed in the Morning Leader regarding the Alexandra school; “the Alexandra School, now occupied by the Normal School, will be to rent from January 1, 1914”. Classes opened for the winter session in the new Normal School building on January 5 of 1914 with 165 students enrolled. At this time a few classes were “still held” outside the building: Manual Training took place at Strathcona School and Domestic Science at Victoria School. Credit: Regina Normal School under construction ca 1913 City of Regina Archival Records Collection : CORA-A-2132…..The first Regina Public library built in 1912 in Regina (demolished in 1961), Eddy Apartments (1914), Saskatchewan Cooperative Elevator Building (1914), the Traveller’s Building (1929), Balfour Apartments (1929) were also designed by the prominent architects Storey and Van Egmond. Regina Normal School 1914 Postcard credit Postcard 12856 Lovell & Co. New Normal School Regina (cca. 1911) Peel….. 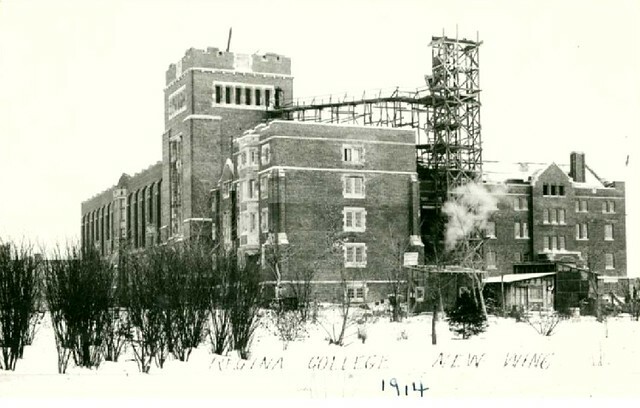 Upon reviewing Wascana Centre Authority plans for the current Regina College building, the Conservatory Building and West Tower were constructed together between the years 1914 to 1916 after the main building was erected. The design plans of Brown and Vallance called for a symmetrical design with both east and west towers, however the east tower was never constructed. The College Building has a variety of styles, shapes and roof forms divided into the west Tower, Conservatory North Block, Conservatory South Block, and Gallery Building. Darke Hall was erected as a separate building adjacent to the College Building. The Regina Normal School was another separate building located near the intersection of College Avenue and Broad Street. adapted from Wascana Centre Authority University of Regina (with permission)…..Dr. R.A. Wilson held the post of principal of the Regina Normal School while T.E. Perrett was serving in World War 1, and Perrett resumed his post in 1915 after being wounded and permanently blinded during his service of duty. Early advertisements announced that the residential school students at the Regina College were prepared for Grade VIII, Junior and Senior Matriculation, and offered classes in household science and dressmaking, business, art expression, music, and agriculture. [ Satisfactory completion of grade 12 was considered junior matriculation, and satisfactory completion of grade 13 was senior matriculation.] Whereas, the Regina Normal School provided teacher training courses. …..Due to the drastic shortage of teachers in Saskatchewan’s history provincial, and temporary teaching certificates were issued in order to prevent school closures. The salaries of teachers in English Canada, 1900-1940: a reappraisal states that a third class certificate was less than a complete high school education. Provisional certificates were those issued when requirements fell short of provincial regulations. In the early 1900s teachers could be hired with a first class, superior first class, second class, provisional, or third class (provincial) teaching certificate. Regina College, Women’s residence is under construction, ca. 1914. (Ph…..oto # 80-2-5) credit U of R Digital Collections…..By 1918, there were 150 enrolled at the Regina Normal School. During the 1920s a “short course” lasting four months was offered by the Normal Schools whereby, a student could upgrade their third class certificate to second class. By 1920 there were 6,500 teachers, for 4,300 schools instructing 151,000 students. The schools operated under 13,000 school trustees and 46 inspectors. The Morning Leader Feb 26, 1920 It was in 1924, that the Normal School system reached peak enrollment applications. 466 students in Regina, and 381 at Saskatoon were registered to attend. Applicants from out of the province had to be turned away. …..F. M Quance served as principal of the Regina Normal School in 1926 followed by G.D. Ralston in 1927. In the province, at the end of 1926, there were 7,779 teachers hired. 1,724 had first class certificates, 3,907 with second class, 2,129 with third class and 19 with provisional certification.Leader Post 1957 Chas. E. Little, president of the Saskatchewan Teacher’s Association, spoke of the need to ensure that all teachers have a second class certificate as a minimum requirement for teaching, and to decrease third class and provisional teachers.Morning Leader 1926 By the start of the 1927 school season, there were three Normal Schools in the province, Regina and Saskatoon with a new one opening up in Moose Jaw. …..With another sizeable donation in 1929 from F.N. Darke to the Regina College, the F.N. Darke Building was erected complete with pipe organ to provide music and art instruction. When the United Church of Canada was formed in 1925, amalgamating the Canadian Methodist Church, the Congregational Union of Canada, and Canadian Presbyterians, the Regina college therefore transferred to the United Church of Canada. Reverend Dr. Ernest W. Stapleford who was the President of the Regina College between 1915 to 1937, had a desire to enable the Regina College to become an independent University. This wish did not come to fruition during his tenure due to the stock market collapse and the drought of the 1930s. 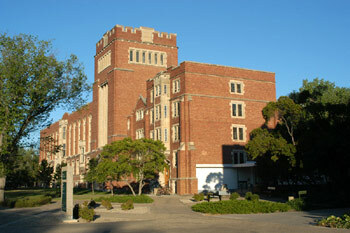 In 1934, the Regina College came under the jurisdiction of the University of Saskatchewan as a second campus of the U of S. severing connections with the United Church of Canada. A gift of $50,000 from the Carnegie Foundation for Higher Education was applied to the accumulated debt of $72,000 against the Regina College. …..G.N. Griffin was appointed principal of the Regina Normal School in 1938. Between 1906 and 1940 22,492 teaching certificates had been issued. The Regina Normal School along with the Regina College buildings served as a Royal Canadian Air Force training centre for the British Commonwealth Air Training Scheme during World War II. 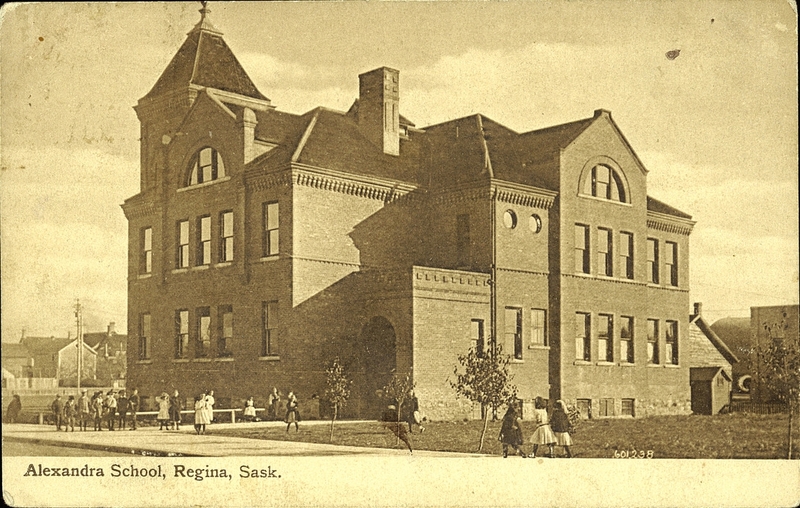 Initially Regina Normal School classes were re-located to the Regina Lakeview School, and then into the Regina Trading Company Building located five blocks away on Scarth Street and 12th Avenue between 1940-1944. The correspondence classes housed at Benson school were also asked to move. Due to declining enrollment, the Regina Normal School closed completely in 1944 and students were served from the Moose Jaw and Saskatoon Normal Schools. Following the second world war, students with a grade 10 or 11 matriculation were no longer accepted into the Normal School system for teacher training. Work done at the normal schools was recognized as first year course work towards a bachelor of education degree by the University of Saskatchewan in 1946. The salaries of teachers in English Canada, 1900-1940: a reappraisal states that generally the requirements for teaching certificates; “a second-class, grade XI or XII (equal to junior matriculation), and a first-class, grade XII or XIII (senior matriculation)”. …..By the early 1950s a drastic shortage of qualified teachers discussions commenced regarding the re-opening of the Regina Normal School. The education system had come to rely on supervisors or “sitters” for classes in Saskatchewan. The name changed to “Teacher’s Colleges” from “Normal Schools” according to the University Act of 1953. In 1956 there were 7,624 teachers hired in the province of Saskatchewan, 1,028 were hired with professional certification, 1,474 with standard, 4,440 possessing interim standard, 298 holding second class certificates, 80 with special and 304 provisional certificates had been issued.Leader Post 1957. When renovations were complete to the interior of the building and the necessary expansions made, the Regina Normal School building re-opened as the Regina’s Teacher’s College in January of 1960. In the fall of 1961, the Regina College opened as the “University of Saskatchewan – Regina Campus” on Wascana Parkway. The original Normal School building became part of the Regina College Avenue complex forming the beginnings of the University at Regina. James M. Pitsula, author of As One Who Serves: The Making of the University of Regina reports, the Normal School at College Avenue and Broad Street served for teacher training classes until the education building was opened on the University of Saskatchewan ~ Regina campus in 1969. The University of Regina achieved full status as an independent university on July 1, 1974. The Era of Saskatchewan One Room Schoolhouses ~ The little white one room school house, what is remembered about it? Saskatchewan Normal School ~ the heritage of teacher training institutes. ← H.W. Balfour’s Truly Impressive Career. Recognized for Outstanding Civic Service and Meritorious Military Achievement.